Get Onboard the ultimate adventure in PNG! BAIA Sportfishing has a once in a lifetime fishing trip you can't miss. 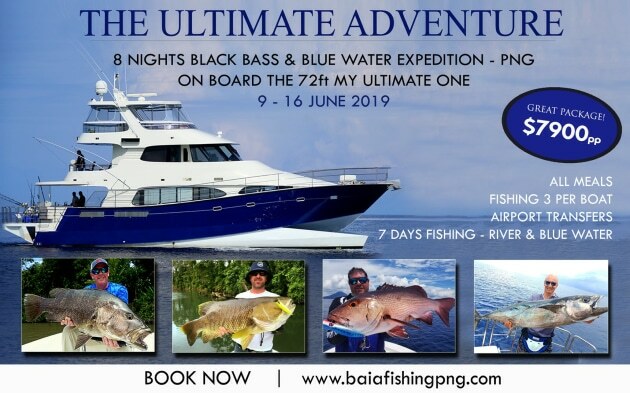 The established PNG sportfishing operator has limited spots left for "The Ultimate Adventure", an 8-night black bass & bluewater expedition from June 9-16 onboard MY Ultimate One. Ultimate One is a 70 foot luxury vessel that has long range capabilities and is equipped with all the electronics needed for offshore expeditions. It has a cruising speed of 25 knots and is geared up with a game chair and outriggers for those who wish to target big blue marlin and sailfish. If you want to catch a Niugini black bass and blue marlin in the same trip. Baia Sportfishing has discovered new river systems loaded with black and spot-tail bass and new offshore reef systems abundant with giant dogtooth tuna, giant trevally, wahoo, yellowfin tuna, sailfish, marlin and many more tropical reef species. To find out more, contact Baia Sportfishing. Don't miss out!